Sign up to our Newsletter for updates, news & events! Metier Member - Have you met? Have you met Simone Aïda Baur ? Here at Métier Rendezvous we like to take the time to really get to know our Interior Designer members. Therefore, we are delighted to be sharing some of their fascinating stories of how they started out as interior designers. Our first interview is with Simone Aïda Baur of Global Inspirations Design. 1. Simone, how long have you been a Métier Rendezvous member? About 5 – 6 years. 2. What have you been most surprised about being a Métier Member? I am based in Zurich, Switzerland. However I’ll happily fly to London (one of the many places I’ve lived in and my favourite city) whenever I can, to attend one of the meetings. Métier Rendezvous is such a wonderful group and for someone like me who is working alone, the input from other interior designers is simply priceless! Everyone is open and willing to share, just brilliant! I am forever grateful to Siobhan (founder and organiser) to have invited me to join this amazing group of people! 3. Who has been your most memorable Métier Rendezvous Brunch Event to date? Probably the talk by Houzz, mostly because it was quite hands on with lots of practical advice, that I could then easily implement. 4. How different was your life / career before you set up Global Inspiration Design? Before launching Global Inspirations Design my life was very different for many reasons. I was working in the luxury hotel industry as my first career, which gave me the opportunity to live on 3 continents and in 7 countries. I am very grateful for this experience, which allowed me to learn about other cultures, languages (I speak 6 languages) and see the world from other perspectives. 5. Thinking back to long before you began your studies, what would you describe as your earliest memory of interior design? What inspired you to launch your own design firm? When I was a little girl, I loved re-arranging my furniture and re-decorating my bedroom. My dad, who is a civil engineer and architect, showed me how to measure up a space and draw to scale from an early age. However, it was only later, when I got to design my many apartments and houses (25 to be exact), in which I have lived over the years, that I started to think about running my own design practice. 6. Simone, what do you think has been your biggest business obstacle or hurdle or business fear to date? Being a solo entrepreneur and being my own boss has been one of the greatest, but also one of the most challenging tasks I have ever taken on. Whilst I love the fact that I can make decisions on the spur of a moment, it can also be daunting, because each decision can change the course of your business for the better or the worse. Global Inspirations Design: Living Room in Basel, Switzerland. 7. Knowing that sometimes the lines blur between balancing a work life and personal life – What are your own non-negotiables that you stick to in your business and home life? That’s an interesting question, which made me realise that I don’t really have any non-negotiables as such… Having worked in the hotel industry for so many years, I am used to working weekends, evenings and public holidays and I continue to do so when necessary. Since I have turned my hobby into my business, I actually do find it somewhat difficult to draw a line. 8. What were the 3 things that happened in your life that made you realise you wanted to run your own business? Running my own interior design business is something that has been in the back of my mind for a long time. The decision, however, was made very gradually. 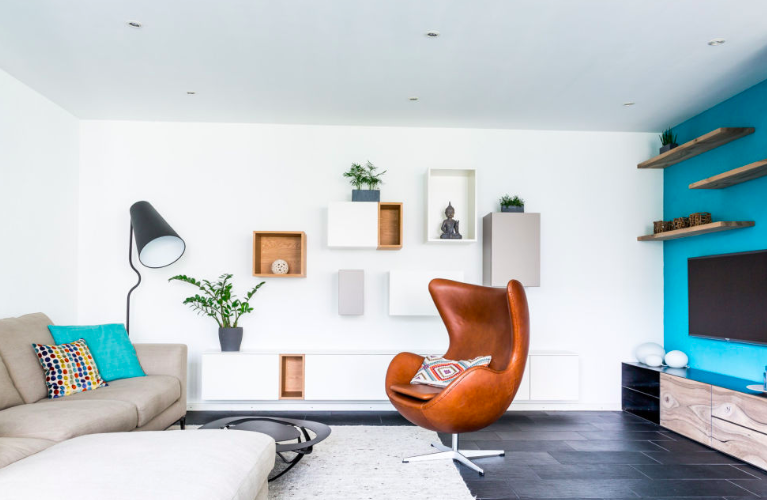 My own home has always been very important to me and I always put a lot of effort into designing each and every home, regardless of how long I would live there, because I truly believe that our home has a great impact on our health and wellbeing. I would spend every free minute planning my space and visiting furniture stores. Friends also consulted with me to help them design their space, which I would gladly do in exchange for a glass of wine. 9.How would you describe your own design/signature style? Modern contemporary with a touch of nostalgia, I’m an advocate for contemporary design and I’m particularly fond of all the latest designs coming from Italy. Contemporary is my base, but then I like to mix in some other styles, integrate my inspirations from around the globe into my concepts and add some colour and lots of texture. 10. When thinking about your favourite projects over the years, how would you describe your favourite clients to work with? I like to build a very close relationship with my clients. In fact, many of my clients end up becoming friends. I believe it is important to know how my clients tick and what makes them happy. I am a very empathetic and intuitive person. This has been very helpful in understanding my clients needs and how to translate them into a design concept. I love clients who value good design, are quick decision makers and fun to be around with. 11. Looking forward into the next 3 years, what do you believe is next for your own business/brand? I would love to grow my business and be able to hire 1 or 2 people to assist me in running the business. In addition, I would love to continue working on more international projects. My dream is to design a boutique hotel so that I can combine my love for hotels, my passion for interior design and my experience in both industries. 12. When you are in creative mode putting together ideas for your client – where do you like to take your inspiration from? My inspiration comes from many different sources and it is usually rather intuitive. Most of the time I have an image pop up before my inner eye fairly quickly when in a space and talking to the client. This image is usually a mixture of impressions and things I had seen on my travels, in a magazine, on the internet, at a trade show or in nature. I particularly like to turn to nature for colour inspirations. Alternatively, I find fabrics a great source of inspiration, which is why I can spend hours in fabric stores. The Chelsea Harbour Design Centre, which is also near to KLC where I studied interior design, is one of my favourite places to visit. As well as the questions, above we would also like to know about your working day for ‘A Day In The Life Of Simone Aïda Baur’, please could you share how your typical day runs? Actually, every day is different, which is one of the things I love about being a solo entrepreneur. Depending on the type of projects I am working on, my days can vary greatly. There are quiet office days, creative days, days filled with meetings with clients, suppliers and partners and days spent on the road sourcing and shopping for furniture, lighting and more. Sourcing and shopping with clients remains my favourite part of my work. For more Métier Rendezvous interior designer members stories and to keep to find out more about our Metier Academy workshops, sign up to our newsletter. Interested in being featured in a future blog post? Feel free to email us directly at info@metier-rendezvous.com. We would love to hear from you! Métier Rendezvous is a friendly informal peer support network for Interior Designers & Architects. 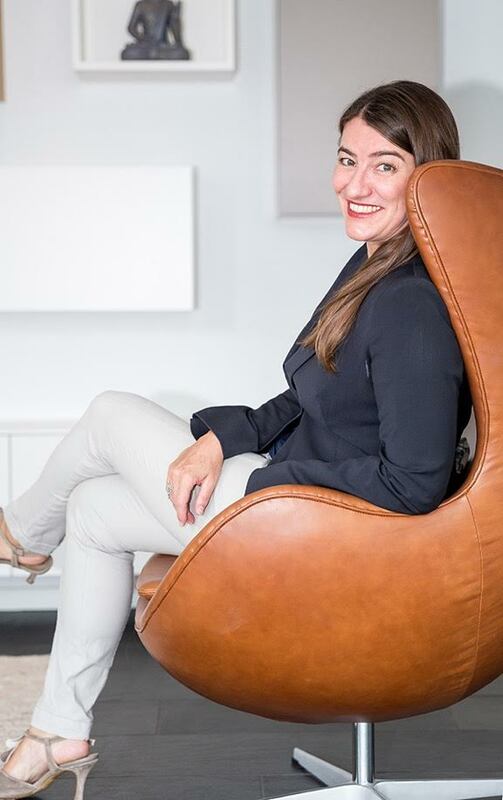 Founded by Interior Designer Siobhan Casey of Casey & Fox, we encourage community over competition and facilitate this through Brunch Networking Events and Business-related Workshops. Metier Member – Have you met?